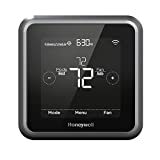 If you’re tired of pressing buttons and twisting dials but you still want a smart thermostat that can help you save money and can be controlled by Alexa, the Honeywell Lyric T5 Wi-Fi Smart Thermostat is exactly what you’ve been waiting for. This thermostat costs a fraction of what you’d pay for a Nest and yet is has one nice feature the Nest does not: a touchscreen. That’s right, no more twisting that dial or pushing buttons. The T5 also has all the smart features you want, including geofencing, and it’s on sale right now on Amazon for less than $100.